I was headed to Bali for the Asian Conference on Remote Sensing, one of our big annual trade show and conferences. We attend every year, as Asia is one of our big markets. Last year the event was in Thailand, and this year, Bali. I was picked to be a presenter at the conference this year, so I had the opportunity to attend, and was looking forward to the event. I left Vancouver on Thursday morning, with the first leg being a short hop from Vancouver to Los Angeles. I was actually dreading this part a bit, as LAX is a horrible airport, and all of my experiences with it have been bad. Interestingly enough, our friends Alex and Fergus ended up being on my flight to LA, and I saw them in the lounge - they were heading to Maui for vacation. We were having some very thick fog at the airport, which delayed the start of our flight, given Alex, Fergus and I a chance to chat. Once we got going, I was lucky enough to get upgraded, making for a good start to the trip. Once we got to LA, things went pretty much as expected. You have to walk between terminals, exiting the airport, which forces you to go back through security and all that hassle. not surprisingly, the line ups were ridiculous. It was a good thing that I had lots of time between my flights, as I used up most of it. The first real leg of my trip was from LA to Tokyo, and was on a Airbus A380. I had booked a good seat on the upper deck of the massive plane. Here is the plane from the gate, in LA. After getting back through security, the new International Terminal is actually quite nice. I didn't have long to wait before we were boarding the flight. My next leg was a long one - LAX to Singapore, with a stop in Tokyo. 11 hours from LAX to Tokyo, then another six to Singapore. I was flying Singapore Airlines, which has the reputation of being one of the best airlines in the world. Another reason I was OK with this route was that this big flight was on an Airbus A380 superjumbo. I had flown on one of these planes before, and liked it a lot. I managed to book an exit row seat, so it was about as good as I could hope for. This long leg from LAX to Tokyo went about as well as could be expected. I don't sleep well on planes, but the entertainment system was good, and I had lots of work with me to keep me entertained. The food wasn't bad either. And the same plane 11 hours later in Tokyo. You can see the dual bridges that access the two different levels of the plane. When we got to Japan, we had a short stop while they refuelled the plane. I had to get off, which was OK as it gave me a chance to check out the airport. The airport was less interesting than I had expected. There were a few stores around, but just your typical duty free stuff. After about an hour we were ready to reboard the plane. The next leg fromTokyo to Singapore was not a lot shorter - 7 hours. I think I got a little bit of sleep, but not a lot. The do feed you well on Singapore Airlines, and the food is pretty good. We got into Singapore at about 3:00 in the morning, and my next flight was at 7:30, so once again I had some time to check out the place. The Singapore airport is huge, but given the time of night most things were closed. Sadly, that included the tram that was thee to take you from one terminal to the next. Down for routine maintenance. Sadly, that left we with a walk that took me the better part of an hour. Good thing I had 3-4 hours to kill. English signs in countries that speak other languages - always fun. 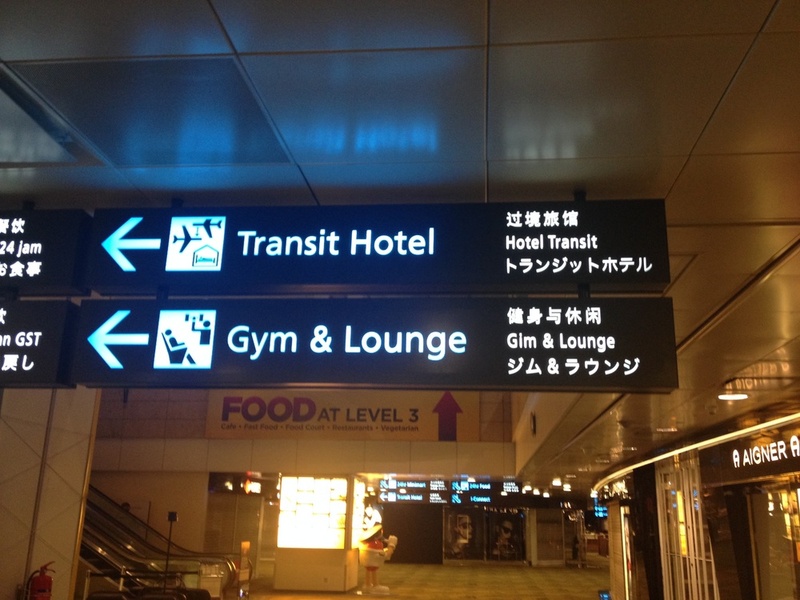 I love how the git "gym" right on the large part of the sign, but wrong on the small part. The Singapore airport is quite nice, for an airport. There are lots of garden areas set-up in many parts of the airport. This nice koi pond offered a distraction for a while during my layover. Once I got to the area of the airport where my next flight was scheduled, I found my gate, then also found a lounge where I was able to get a shower. That left me feeling infinitely better, and interested in finding some food. There was a “24 hour” food court upstairs that seemed promising, so I headed up to check it out. Sadly, by “24-hour” they meant McDonalds. All that killed a bit of time, and before long I was queuing for the gate, and hoping on my flight to Bali. It had been a ridiculously long trip, and the 2 ½ hour final leg was a piece of cake. It was just before noon when I got into the Bali airport, and god it was hot!